LIFE B2E4sustainable-WWTP is a demonstration project that aims to improve the performance of overloaded (and thus, under-performing) extended aeration Wastewater Treatment Plants (WWTPs) and protect aquatic environment against pollution caused by WWTPs effluent, at significantly reduced energy requirements by means of a novel process for upfront solids removal(prior to aeration tank). 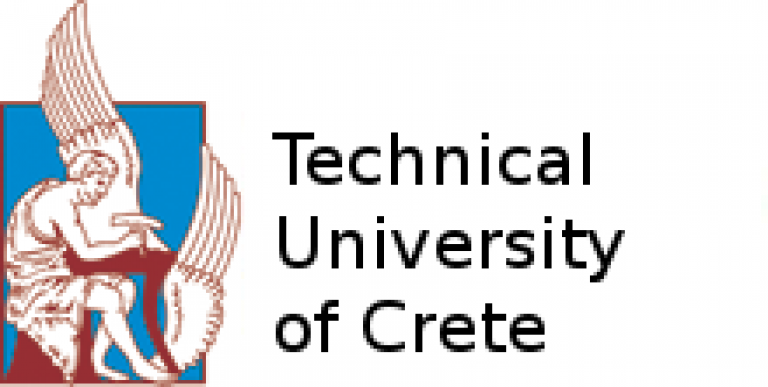 Additionally, the project will demonstrate the valorization of the produced biosolids for electric energy production (through gasification), thus reducing further the net energy consumption of the WWTP, and consequently reducing the emission of greenhouse gases. The produced electric energy will be sufficient for energy self-sustainable operation for wastewater treatment. To achieve total energy self-sufficiency on the demonstrative plant. To improve the performance of exiting extended aeration WWTPs due to upfront (upstream of aeration tank) removal of a large faction of TSS and BOD. To significantly reduce the energy requirements of existing extended aeration WWTPs. To reduce the environmental impact of sewage sludge management by applying an innovative treatment system of sludge that transforms sludge into energy and minimal solid inert waste. 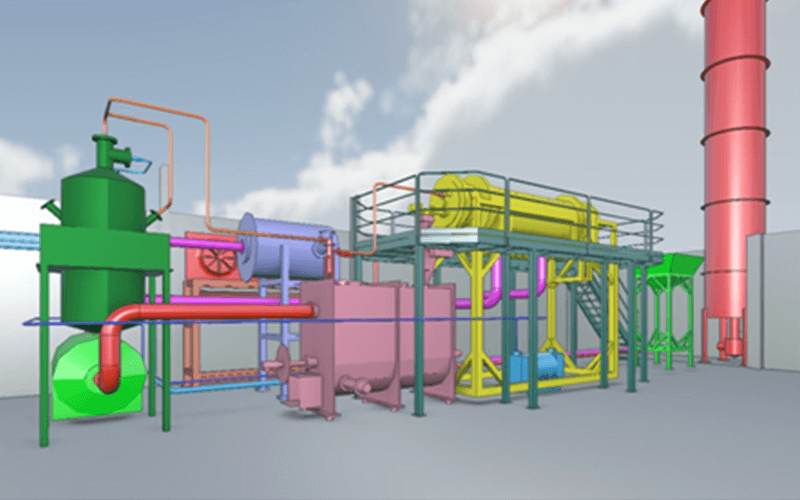 To reduce the carbon footprint and Greenhouse Gases (GHG) emissions due to the significant reduction of the process energy requirements together with the green energy recovery from biosolids through gasification. To remove up to 60% of Total Suspended Solids (TSS) at very early stage prior to aeration tank treatment. To produce electric energy by means of gasification of 100% organic carbon of biosolids, with the parallel production of low volume sterile solid waste. To demonstrate the feasibility of avoiding the sewage sludge disposal in small and medium sized WWTP’s. To integrate the life cycle and environmental risks assessment and contribute to new standards for wastewater treatment. To produce new, environmental friendly, standards in municipal wastewater concept. To promote the new process in European municipalities, water industries and the whole chain of stakeholders. 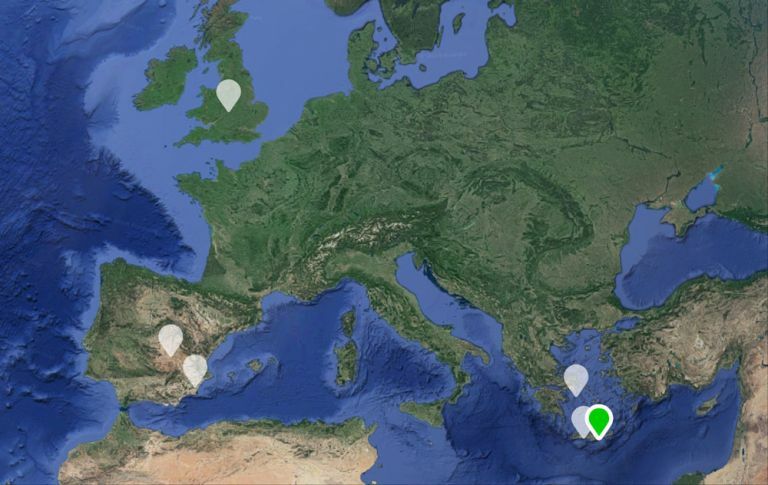 To determinate the potential transferability of the technology to other European regions and use with urban water, and the future application for industrial wastewater. 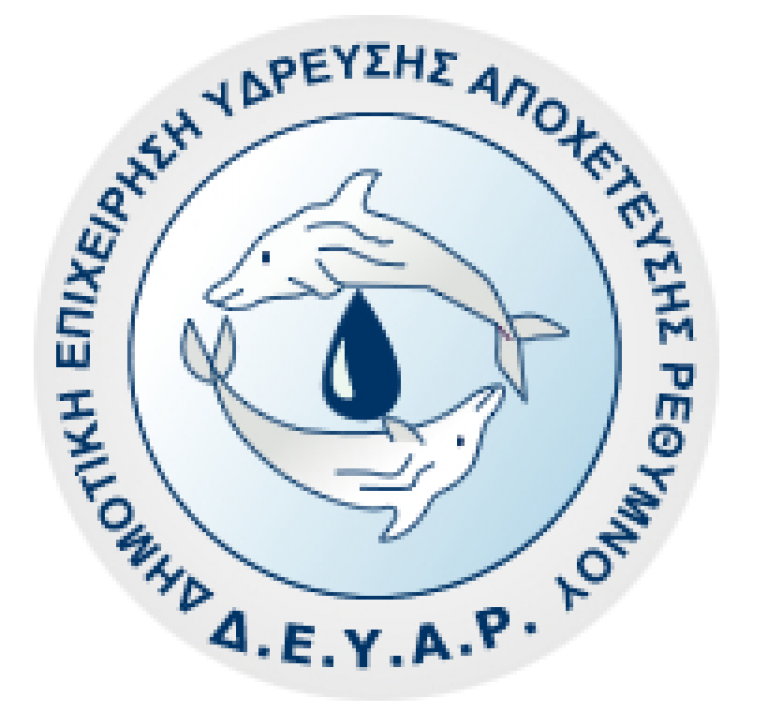 Improvement of the quality of the aquatic environment, due to upgrade of the performance of existing overloaded WWTPs. A new concept of municipal wastewater treatment with better performance, compared with conventional extended aeration process. The production of significant amount of green energy that can make the new process self-sustainable and eliminate biosolids mass through gasification. A high reduction in energy requirements for municipal wastewater treatment plants, beyond 70%, compared to conventional extended aeration process. A reduction of carbon footprint of WWTP by around 44 tones CO2/year coming from the energy reduction and from the production of green energy. To provide biosolids (about 1 ton/day, dry basis) with low water content and high chemical energy, able to generate syngas and then electric power. A production of primary biosolids with solids content up to 45% (just out of the microscreen), compared with 5% of primary sludge. A complete sterilization of the produced biosolids (primary and secondary) and a reduction of sludge to the minimum possible mass of ash content (5-10% of dry matter). A high reduction of footprint for the removal of primary biosolids, up to 20 times compared to primary clarification. An improvement in secondary treatment of wastewater due to the lower concentration of TSS and BOD. 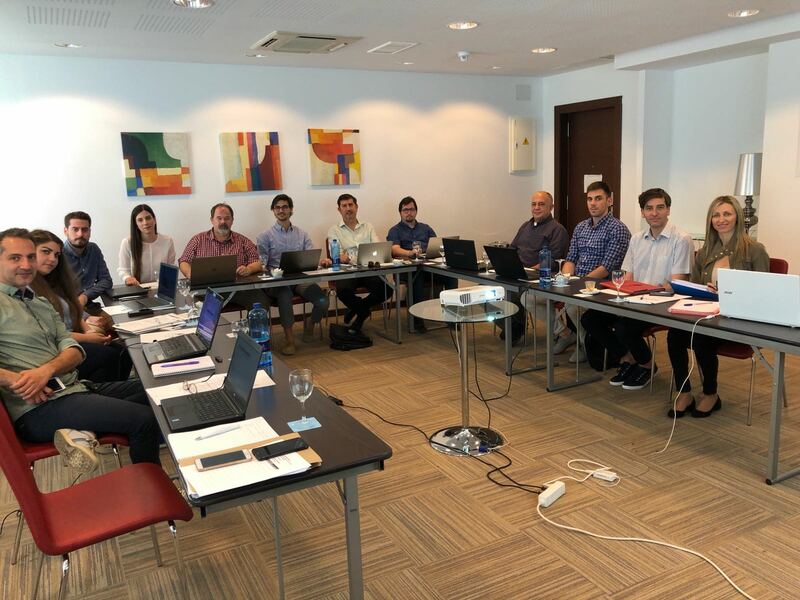 A high impact for European Water Agencies by means of the replication of the new process to increase the performance of existing WWTPs or install new in the wide market in Europe and in other regions. Primary clarification is the first step of WWT in a classical WWTP for the removal of about 50-60% of TSS and 30-40% of BOD. The hydraulic retention time in primary clarifiers typically varies between 1.5-2.5h and they occupy a significant fraction of the footprint of conventional WWTPs and often limit the potential for expansion of the hydraulic capacity of existing plants if there is no free space available. The solid content of primary sludge is between 3-5%, and after dewatering can be increased up to20%. However, as no primary clarification is practiced in extended aeration systems, the wastewater, after the headwork, enters directly into the aeration tank. It has a dramatic impact on the energy consumption by the aeration process, as TSS that could have been removed by clarification is digested by aerobic microorganisms. Thus, extensive aeration is energy intensive and it is likely that it will be gradually abandoned due to the high cost of aeration energy. An alternative process for the removal of the primary solids is the use of a fine mesh sieve (microscreen), which can produce biosolids with solid content up to 45%. The high solids content of sludge removed by the microscreen makes it much more suitable to be used as gasifier feed stock, compared to the primary sludge (which even after dewatering contains at max. 20% of solids). Microscreen requires 1/20 the area of an equivalent capacity primary clarifier, while, their operation can follow the inlet flowrate (e.g. microscreens can be turned off during reduced flowrates, while this is not an option for primary clarifiers). The projected dryer, bases its operation on the agitation of humid material in the flow of hot air produced by the gasifier as exhaust gases. 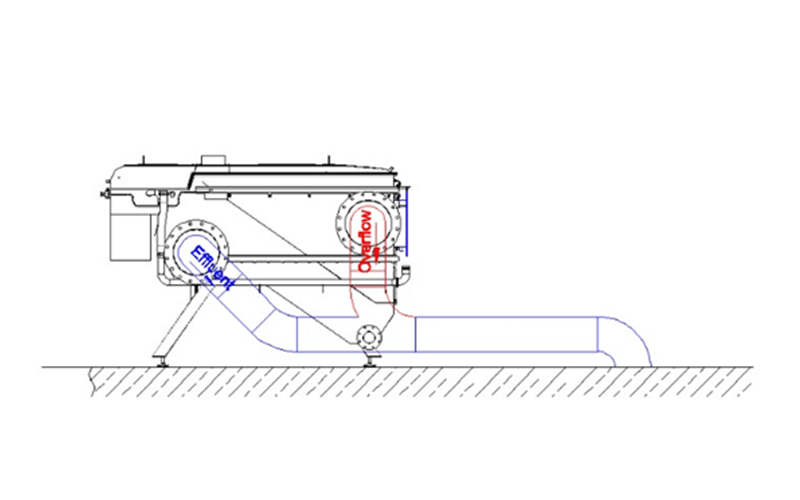 Special conveying and simultaneous continuous agitation augers, ensures the material’s permanence of the material in the hot air flow, throughout the 12 meter path (2 mod X 6 meters each). Before the end of each module, humid air is sucked in from the suction circuit. In each module is introduced hot and dry air by the hot air distribution system. The suction circuit is discharged into a cyclone to catch volatile and light particles. The output of the second module that would be the final output of the treated material, is mixed with the material captured by the cyclone, and then conducted to the gasifier. The gaseous product of gasification (main compounds: CO, H2 and small amounts of CH4), known as syngas, can be used as fuel for the production of heat and electric energy. 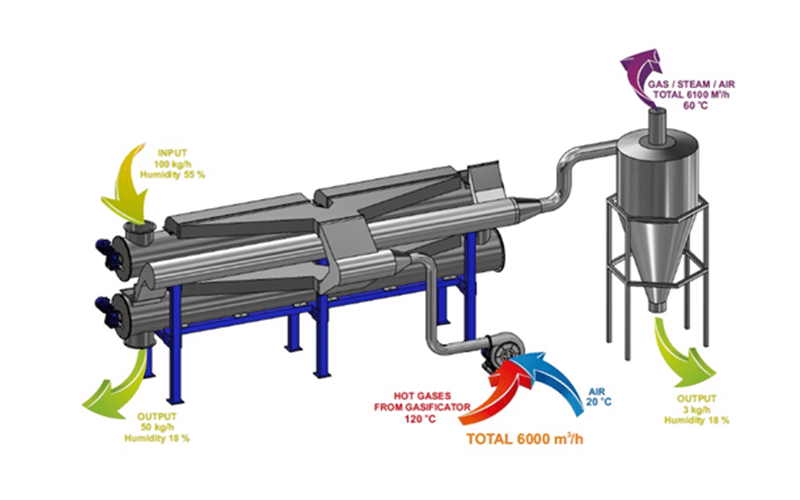 Heat energy could be recovered and used to partially dry the biosolids prior to gasification. The biosolids produced from the microscreen have high potential for gasification and production of syngas. Complete biosolids drying is not essential, as the optimum moisture content for biosolids gasification is between 15-20%. Biosolids remaining mixture is needed to fix the C/O ratio close to 1/1. This ratio is in favor of carbon, which requires moisture to provide the extra oxygen. Gasification is a significantly more efficient process for electrical energy production, as it yields approx. 190% of the energy that may be produced by the anaerobic digestion (AD) process, using almost 100% of the carbon in sludge, while AD can utilize up to 50-60%. 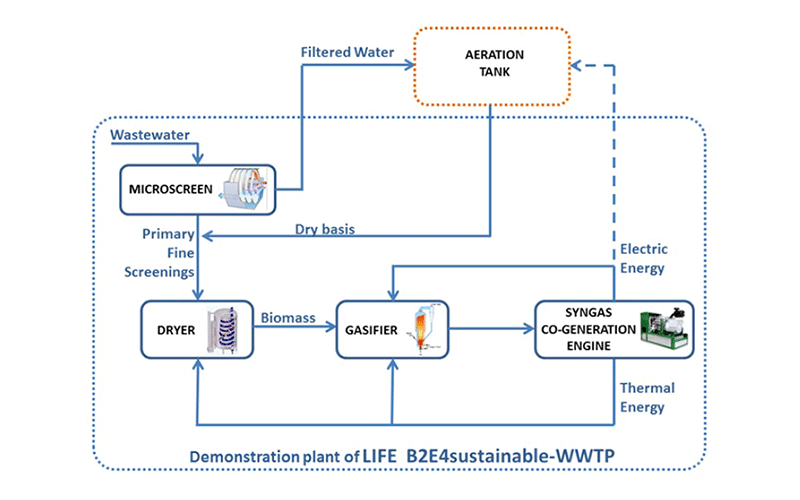 Gasification is preferable when biosolids content is high (the case of LIFE B2E4sustainable-WWTP after the microscreen pre-treatment). AD is more favorable with wetter biosolids (80% moisture), but its residues contains a relatively large fraction of organic matter that requires further treatment. 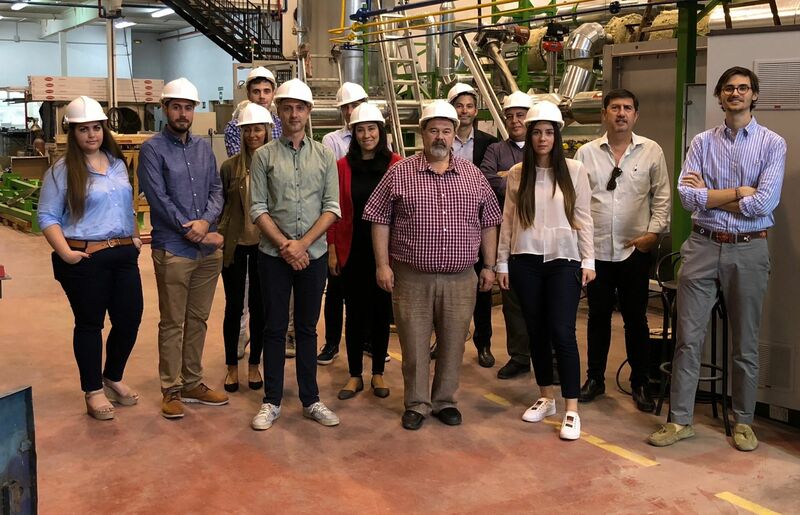 LIFE partners visited the gasifier of the project. 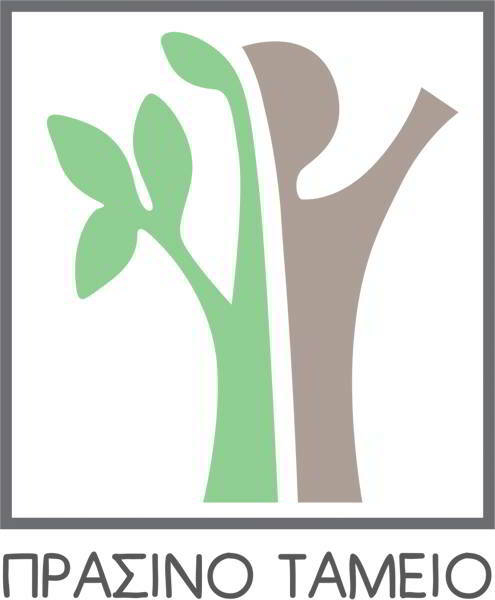 Project Funded by the European Commission under the LIFE Framework Programme.